We are ATTEMPTING to prepare our beach bodies here at Brandefy. While cupcakes and tacos beckon, we are incorporating some quality snacks into our diets. We headed to BJ's Wholesale to try their version of Kind bars, as well as Vita Coco coconut water. While neither dupe was exactly like the name brand, they are both similar and may be worth switching to depending on your preferences. Brandefy compares store brands (e.g., Wellsley Farms) to name brands (e.g., Kind) to show you when the generic is as good as the name brand, and to warn you when it is not. Our goal is to help you save time and money, and to have a good time while doing it. Wellsley Farms Nut Bars come in many flavors, all of which are copies of Kind bar flavors. We picked up peanut butter dark chocolate bars to test. Both are loaded with nuts and protein. We thought the flavor of both bars was similar, and they both smelled tantalizing. The Kind bars have 10 fewer calories than the BJ's bars. The main difference we found here was in texture. 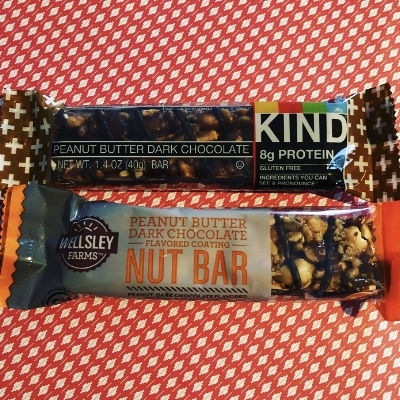 Kind bars have a nice, chewy texture, while Wellsley Farms are crispy. One tester commented that his bar tasted stale. If you prefer a crispy texture, you may like this bar more. We gave the BJ's version a 70% similarity rating in both ingredient panels and overall. If you decide to make the switch, you will save almost $5.00 on a pack of 18 bars. We love coconut water for post-workout. It is a little sweet, but not loaded with sugar. We are big Vita Coco fans here at Brandefy, so we were excited to see that BJ's Wholesale makes a dupe. Both coconut waters tasted very similar, and ingredient panels were nearly the same. Both have 45 calories a serving. We gave the Wellsley Farms coconut water a similarity score of 90%. The only difference we saw was that when poured into clear glasses, the store brand was a little murkier than the name brand. This was not a big deal for us because the taste was the same.